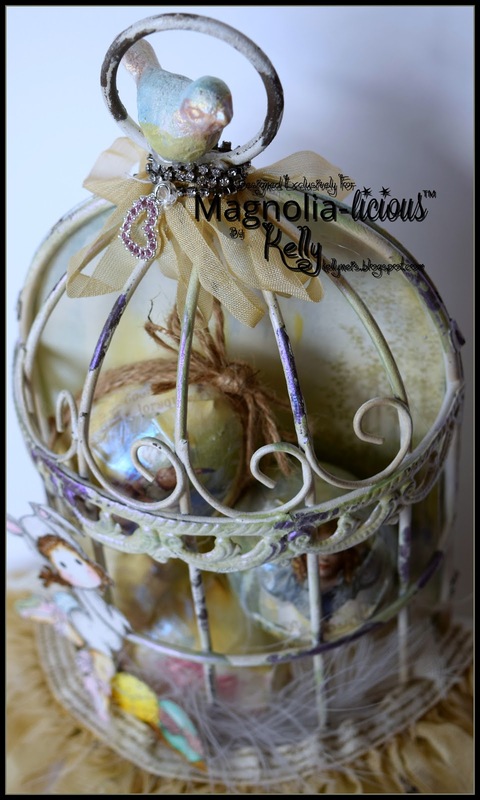 Hello everyone and Happy Easter from all of us at the Magnolia-licious Challenge Blog!! We are having a Easter Blog Hop for you today! If you have hopped over to me from the talented Karen Gauthier then you are on the right track, if not please check back at the Magnolia-licious Blog for the complete list of our design team. I have a used a bird cage from Prima and Finnabar's Art Alchemy paint to make the cage a metallic green gold color but keeping the shabby feel of it. Prima Frameworks birdcage came with the ceramic bird so I painted it with a few of the Art Alchemy paint colors. The background paper is from Pions latest collection Easter Greetings, gorgeous paper! I also paper mache it on the eggs also. Then I painted over them with the Art Alchemy paint. My image is the sweet and sassy Ballerina Bunny Tilda and the Mini Two Egg stamp. They are both colored with Distressed Inks and stickles for a little shine. The Art Alchemy paints turn color depending on the background color your item has. The shabby gray parts turned purple while the antique white turned green gold. I love them. 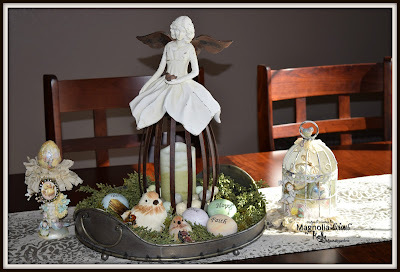 My Easter decor item is on my dining room table, something I will use for every Easter. ￼￼2. Leave a comment on each DT’s post during the hop. ￼leave a comment there as well for a chance to win a prize. 1.  All comments received are counted and a random winner is chosen. Remember to count the Hidden Rabbits on our blogs and good luck to you all!! Oh Kelly, what a beautiful table centerpiece! I love what you did and the colors are gorgeous! I love birdcage accents! You did a wonderful job, and the vintage feel is so well designed! Brava! 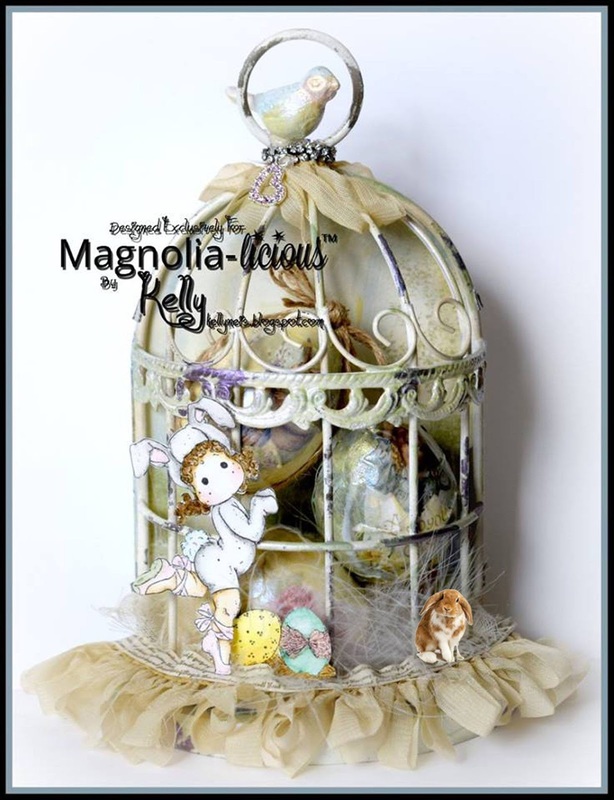 Love your pretty birdcage project! Lovely details! I love your birdcage! The colors are spectacular. Love the eggs you added to the inside of the cage. Another fabulous creation! Wow, what a fabulous and unique creation. Love the alchemy treatment you gave your birdcage. And it sure looks great on your dining table. Love it! Love this! These would make awesome place setting gifts for Easter dinner company. Tilda is just to cute and colored so beautifully. I just look into the Art Alchemy paints as they sound like they would be so fun to work with. Gorgeous bird cage and Tilda bunny is too cute. 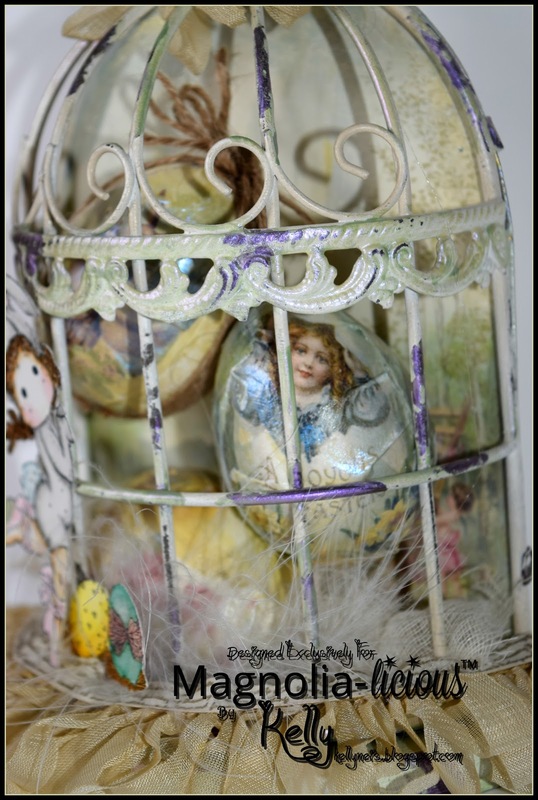 Lovely bird cage and love the scene you created.